The Marine Mammal Center : Return to the Sea! Cletus, a California sea lion, scans his surroundings before diving into the water at the Channel Islands. 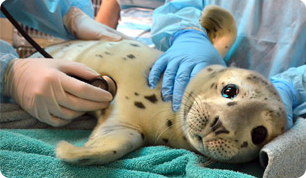 He received medical care at The Marine Mammal Center in Sausalito, CA. On a beautiful Saturday, October 9, 2010, The Marine Mammal Center partnered with the Channel Islands Marine and Wildlife Institute of Santa Barbara to release two fur seals and two California sea lions in the Channel Islands. The two fur seals released were Gargle and Tot, and the two California sea lions were Lovebug and Cletus. The marine mammals were released off of a boat called the Condor Express. Gargle, a female yearling northern fur seal, was admitted on August 12 from San Mateo County for malnutrition. Tot, a female yearling Guadalupe fur seal, was admitted from July 31 from Ocean Beach in San Francisco and was also treated for malnutrition. Tot was a re-strand, meaning she had been rescued and released prior to this particular event. Lovebug and Cletus, the two California sea lions, were also re-strands. Lovebug, a male yearling, was admitted on August 29 from San Mateo County. He was treated for malnutrition and pneumonia. He was originally admitted from San Luis Obispo County back in June. Cletus, a sub-adult male, came from Santa Cruz County on August 22 and was also admitted for malnutrition and pneumonia. He re-stranded after he was first released on Coastal Clean-Up Day at Rodeo Beach. In order for an animal to be released back into the wild like these four former patients, the marine mammal must pass a final examination by the Center’s veterinary staff. Of course, they must also be able to forage for fish on their own in order to be returned to their ocean home. All of the Center patients receive a flipper tag. Some receive satellite or radio tags to facilitate tracking of their progress in the future. What is the release rate of patients to the Center? It tends to hover at just over half. This overall survival rate of just over 50% is an extremely positive statistic when considered in the context of the very sick animals that the Center rescues and treats. It's your support that makes our work in rescuing and treating these animals possible. Learn how your generosity can directly benefit the Center's patients through membership, donations, volunteering and even Adopting-a-Seal! The Marine Mammal Center extends its sincere gratitude for the collaboration with the Channel Islands Marine and Wildlife Institute of Santa Barbara and the staff of the Condor Express boat, as well as photographer Robert Perry who took all of these release photos.